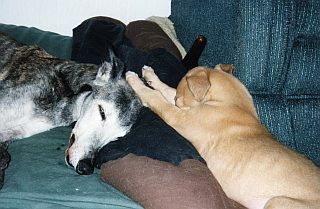 Old Mr Bones passed two days after puppy Cullen arrived. When Sally Jesse Raphael did a morning talk show years ago on pet loss, her panelists were all owners who had been through the euthanasia of their pets. In the course of the show Sally said that she had never been able to have a pet euthanized and didn’t think she could do it. That really caught my attention. What she hadn’t mentioned was what happened to her pets at the end of their life. So what is the right time? I have a simple answer, but the reality is not so simple. The answer is that the dog will usually tell me when it is time, most often by refusing to eat the most enticing meals I can prepare. At the end of their lives my dogs eat extremely well, as their appetite decreases, and I resort to creative cooking to keep them eating. The second criteria is the inability to walk. As dogs age their ability to transmit nerve impulses from their brain to their hindquarter deteriorates. They also lose muscle strength. The same thing happens to old people, which is why nursing homes are filled with elderly folks in wheelchairs. The very old lose control over their hindquarter. The third criteria is a dog who receives a fatal diagnosis while it is under anesthesia. That has happened twice and in both cases I have asked that the dog not be brought back to consciousness. It didn’t seem a kindness to bring them around when they would only have to face their terminal condition and yet another anesthetic procedure for the euthanasia. But these were the hardest deaths to grieve, because the decision was made over the phone. I was not there to hold them or say goodbye. Since two of my three criteria for euthanasia have to do with appetite and walking ability, I was a little stricken when one morning last fall, thirteen year old Lady woke up, got out of bed, and fell over on her side. I carried her outside and watched her totter around the yard. As long as she kept moving she stayed upright as she plainly realized that if she tried to stand still she was going to fall over. This is quite common in old dogs. Gradually her coordination became slightly better. She had also been incontinent during the night. She didn’t have the telltale bad breath of kidney failure, but I was assuming that her kidneys were failing so I took her for blood work to see how bad they were. The vet looked at her standing braced on unsteady legs and carried her into the back room to draw the blood. Surprisingly her kidneys were fine, but the blood values indicated a deteriorating liver. A month later she once again woke up unable to stand and I again carried her outside and watched her walk circles of the yard in the winter morning. It was a work day and I debated whether I should take the morning off and call for her final appointment. But I watched her determination as she walked intent on staying upright when both legs on her left side were weak and uncoordinated. She wouldn’t eat her usual breakfast. Lately her appetite in the morning had been poor. This is a dog that has eaten everything that came her way all her life, who had stolen and consumed countless loaves of sourdough bread off my counters — so I offered her some sourdough bread for breakfast and she ate it. I wasn’t any too sure that she would be able to manage the three stairs down to the utility room and the dog door, but I wished her well, left her with a couple of sourdough rolls, closed the front door with misgivings and left for work. Watching an ailing dog’s every move can drive me into a fit of anxiety. Sometimes it is necessary to give them time to recover, and leaving them in peace for a few hours can work wonders. When I came home that night the first thing I saw was Lady curled up on her day bed. The day bed is quite tall. I would never have bet on her being able to leap onto it. She didn’t look like she was planning on moving again ever, but the phone rang, and while I was talking, she slid off the day bed and walked over to me looking for more sourdough bread. In my delight to see her I completely lost the thread of the call. It was a good night. She was on her feet and I had found something that she would eat. I assumed that she was still in the end-stage of liver failure, but we had some time. Time to cast her footprints. (I keep home made stepping stones with each dog’s paw prints in them.) Time to say goodbye. Time, hopefully, so that she wouldn’t have to die just before Christmas. She was still queasy in the morning, which is one of the symptoms of both liver and kidney failure. I put non-skid mats on the linoleum in the kitchen to give her shaky legs better traction, and had to be careful that the younger dogs didn’t knock her down, which really offended her. I cooked the macaroni and cheese, and boiled turkey soup which she liked so much that she would even eat her low protein kibble when the soup was poured over it. She ate a lot of sourdough bread, rolls and baguettes. Lady had been eating one of the high quality senior kibbles. To decrease her protein even further, I put her on KD, the prescription diet for kidney disorders. When I told my vet that I wanted to try KD he thought it was an odd idea but figured it wouldn’t hurt her. The liver and the kidneys both filter toxins out of the blood and a low protein diet would help them both. She made it past Christmas. At the end of three weeks she was getting around spryly, eating like her old self on turkey soup and KD, and she actually ran across the yard like she used to. When Lady was at her worst, I had dedicated the Best of Breed Trophy at the Northern California Greyhound Specialty to her. Usually you wait until a dog is deceased to dedicate a trophy to them, but I thought that the chance was remote that she would be alive until April to see that trophy awarded. When I was treating her in December all I was hoping for was to get her past Christmas. I had no hope that she would bounce back to her earlier geriatric self the way she did. What caused her recovery? I only made two long-term changes in her care. One was to take her off her senior food and put her on KD. The other was to stop giving her Heartguard. I usually give it year around, but Ivermectin is a substance that attacks the central nervous system and her central nervous system was having all the trouble it could handle. Besides, if she was a candidate in the short term for euthanasia, then she wasn’t going to have time to develop heartworms. After a few months of recovery, I put her back on Heartguard but have no intention of ever putting her back on senior kibble. She can stay on KD for the rest of her life. She is happy. She is content. She has control of her legs. She can leap on and off of the day bed with ease. Sometimes you can hardly get an old dog to the vet soon enough to end their suffering, and sometimes when they are not suffering, it helps to procrastinate a little bit. Especially with very old dogs who have good days and bad days. Lady went through a bad spell, but she never quite stopped eating. I didn’t quite make the final call, and she had recovered quite nicely. She is now fourteen. She did live to see her trophy awarded. Her liver is still not in good shape. But she is eating and walking and barking at the younger dogs who don’t show her enough respect and I don’t have to make the decision for that final appointment just yet. Not yet. This article was originally published in Sighthound Review, November-December, 1993.